We are delighted to share an exquisite weekend of dance with You! Suitable for Oriental, Tribal and Fusion dancers alike. Combining and layering authentic Asiatic dances in a brand new multi-dance style choreography. We will explore and combine the roots and links of Egyptian, Indian, Balinese and Nepalese dances to create a ‘true and seamless fusion’. Using Hossam’s philosophy of “Your Moves = The Music” from his Drumzy School Of Music & Dance. This, combined with the inimitable dancing style and techniques of Katie, who’s experience of living, travelling and studying cultural dances in each of these countries goes unprecedented. Learn methods as to how to authentically interpret and adapt to all styles of music from the heart in ‘Your own unique way’. *Suitable for all levels. All welcome. Welcome to a day of dancing to the live drumming of Hossam Ramzy, featuring intricate and innovative dance interpretations by Katie Holland. Learn the Art of How to Dance a Drum Solo; live or pre-recorded as you are guided by Hossams rhythmic theory of ‘3 – Roots, Trunks & Branches’. You will never be confused about rhythms again! We will delve into the history of this unique form of artistic and playful interaction between dancer and drummer supporting you to create your own exciting style! A workshop you will never forget! 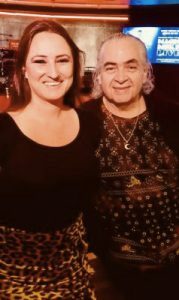 Hossam Ramzy is a master percussionist, composer, arranger and producer who has dedicated his life to creating Egyptian & World music especially for Belly Dance. The creator of at least 35 albums. Hossam is a world leading Dance instructor and educator into the philosophy of how to become ONE with the music and interpret Egyptian music with motion. He tours the world, teaching this philosophy. His passion for music and his distinctive sound has made him well-known worldwide – you have heard him playing with an amazing array of diverse musical legends, from Sting to Luciano Pavarotti to Jay-Z. Katie Holland is a renowned and highly sought after professional dancer across the globe. Dedicating her life to the study and embodiment of world dances, she has performed with an array of traditional ME and fusion musicians such as Hossam Ramzy, Saleh Heby, Cheb I Sabbah, Simon Webster, Jon Sterckx. Her knowledge covers a myriad of sacred and cultural dances including Egyptian, Bharatnatyam, Balinese, Nepalese, Gurdjieff, Sufi Whirling, Bollywood, Afro-Samba, Osho dynamic meditation. All with masters who align with authentic and cultural values; who also gave their blessing for fusion interpretation. Katie’s unique expertise lies in her ability to embrace and combine traditional dance techniques with movement somatics. Her body becoming an instrument for absolute musical interpretation. Together, Hossam and Katie present an insurmountable wealth of knowledge; particularly in grass roots dance and music fusion. Their collaboration is based on a deep mutual respect and admiration for one another’s work. Encouraging and supporting dancers and drummers to embody their sovereign potential without compromising the artists natural interpretations within the dance and music. 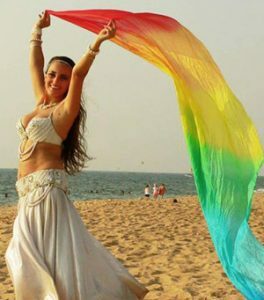 Discover a new paradigm of belly dance and rhythm – embrace your passion, artistry and power!